On Checkout 51’s list this week (Sept 19-25, 2013) is Select Similac® Products, Similac Go & Grow, Similac Lower Iron, and Similac Iron fortified, 900g varieties. 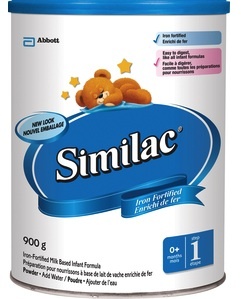 All Similac Isomil products in powder, 800g. Nutritionally complete, milk-based, iron-fortified infant formula for healthy term babies.Similac Iron Fortified – contains 1.2 mg of iron per 100 mL of formula, Tummy friendly and easy to digest, No palm olein oil, Gluten-free, Kosher, Contains a patented blend of Nucleotides, designed to be similar to breast milk (72 mg per litre). You will get $3.00 cash back rebate at Checkout 51. Here’s a pic of what it looks like. I found a couple prices of it at a few stores.